One of the most regular search terms that bring hits to our blog are people looking to buy the Specialized-lululemon team kit. Their 2014 kit isn’t in the team’s online shop yet, but they do have some of the 2012/2013 design left for women at the moment. However, if you like the styling, and want more, I do have a solution for you – Velocio.cc. This company is part-owned by Specialized-lululemon owner/manager Kristy Scrymgeour, and you can definitely see the Spec-lulu influence in some of their clothes, especially around the neck – and they have men’s clothing, but as you might expect, much more women’s, including t-shirts in male and female cuts. The women’s clothing range from USA XS to XL (UK 8-16, but they have a comprehensive size chart with inches, cm and conversions to standard sizes) and because they’ll start shipping in March, they have a pre-order promo code for 10% off. Have a look! If you’ve been wondering what the rest of the 2014 peloton will look like, I’ve pulled together a Podium Café post with the jerseys from all the big teams and two wild cards, with a poll for which like best. You can talk about why, or what you don’t like, or anything else, in the comments (or just lurk and see what everyone else is saying…). Voting’s been nice and busy, and if I know you can buy the kit, I’ve put in a link. Head over and have a look – there have been lots of changes and lots of variety, I can’t wait to watch them race in it all! Every now and then it’s Shirt Week on the blog, where I get excited about buying bike clothing, and have to hide my credit card. I’ve mentioned that you can buy the Specialized-lululemon team kit before, and I’ve loved the optical illusions stripes since they launched it. If you’ve been thinking about buying it too, here’s an incentive – the Specialized-lululemon 2013 Summer Sale! 10% off all their kit! Go to the team shop, and if you like what you see, buy it! They’ve got the women’s short sleeve jersey, long-sleeved jersey, bib shorts, wind vest and wind jacket. I don’t know how long that code is valid for, but it was launched on 12th August, so it’ll be good for a while, I’m guessing. If the Spec-lulu clothing isn’t for you, and you’re after other cycling clothing, or women’s cycling team kit, browse around the Shirt Week tag and maybe that can help. As always, I don’t have any affiliation or get any benefit from promoting these, I just really like them! Shirt week again – Wiggle Honda edition! It’s shirt week again! 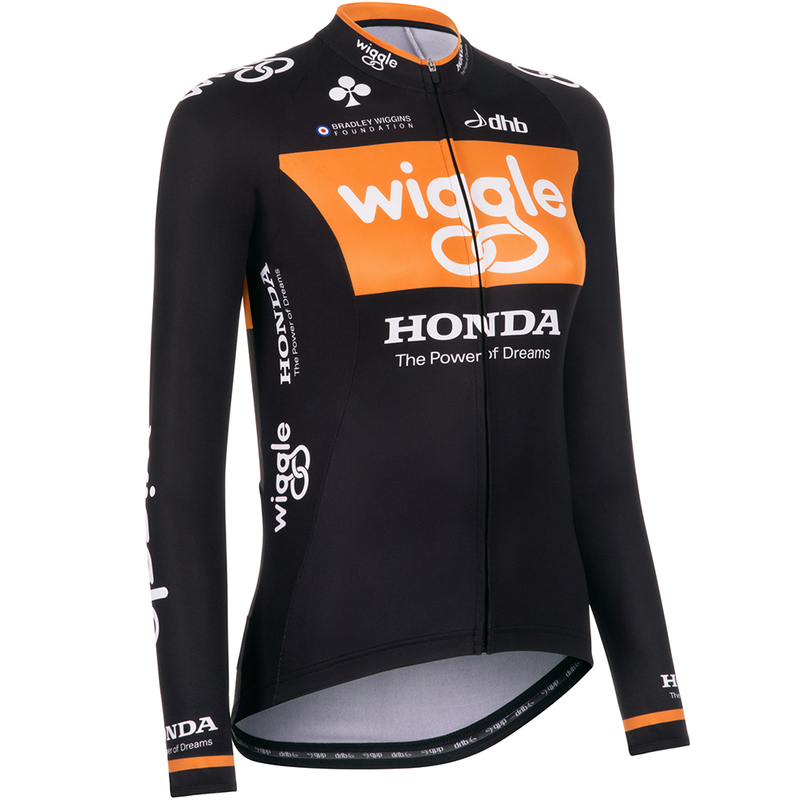 I’m always happy to see opportunities for fans to buy women’s cycling team kit – I’ve talked before about how you can buy replica team cycling clothing from Specialized-lululemon and Vanderkitten – so of course I’m happy to see pro team Wiggle Honda get in on the action! You can now buy their short-sleeved jerseys (women’s and men’s cut), women’s cut long-sleeved jersey and bib shorts in short (women’s and men’s) and long for women, all (unsurprisingly) on the title sponsor, Wiggle‘s, online shop – here’s the Wiggle Honda shop page on there, if you want to keep track of anything else that’s added. I’m collecting a little list of women’s teams kit that people can buy – so if you know of other team clothing, I’d love it if you left me a comment! The Unofficial Unsanctioned Social Media Jersey – Dan and Sarah’s craziest idea yet! Dan and I are real life friends who have never actually met in real life, and one of the reasons that he suggested we start podcasting is our shared love of the stories in women’s cycling, and the fact we both want to do our bit to help the sport we love, however we can. We especially love the way that riders share their experiences of life on the road through their blogs, twitter accounts, team websites, and things they write, in between insane transfers and killer racing. We really appreciate all their time and effort, and how they share their own passion for the cycling, and give us new insights, so although we don’t get as much of the mainstream media, we get something far more personal, and real. And it kind of pisses us off that when they’re doing this, they’re doing it for love, and hardly get any financial rewards at all. Isn’t it crazy, that €150 is a normal-looking prize for a General Classification jersey, or the Queen of the Mountains prize, in a top-level race? But on the other hand, if jersey prizes pay so little…. That means we can set up one of our own! And all you fans of women’s cycling can help us create one and decide who wins it! Here’s the plan: Dan and I will put $25 each of our own money into a pot, and this will be the jersey prize for the inaugural Unofficial Unsanctioned Women’s Social Media jersey!